Letters Make Words is an app for the iPad. Young children learn rhythmic movement for letter formation and the sounds of letters in words. Beginners’ Handwriting introduces letters. It develops good gross motor movement and the skills children need for a lifetime of easy, legible writing. Playful Beginnings is a complete, downloadable program for the youngest learners. 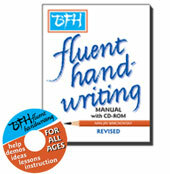 BFH Fluent Handwriting Manual with its CD-ROM is a complete instructional package for all ages. More at BFH Fluent Handwriting Manual. 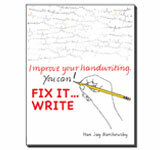 Fix It...Write is help to correct, improve or change one's handwriting. Barchowsky Dot OT and Barchowsky Fluent Hand OT are fonts you use to create your own exemplars.